Founded in Chicago in 1936, Skidmore, Owings & Merrill (SOM) has created many high-profile Chicago commercial buildings, among them the Inland Steel Building, the John Hancock Center, the Sears Tower (now Willis Tower), and in 2009, the Trump International Hotel and Tower. 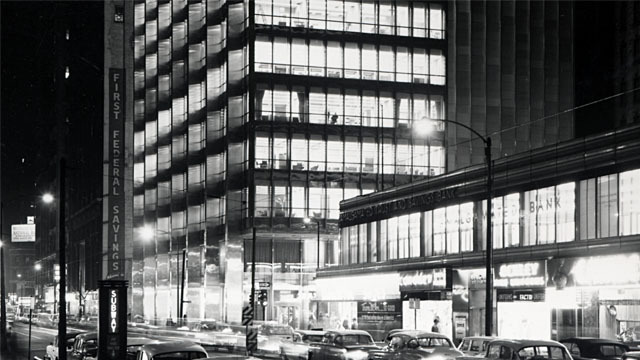 The late SOM architect Bruce Graham is responsible for the designs of both the Sears Tower and the John Hancock Center, working in collaboration with noted structural engineer Fazlur Khan. In addition to its work in Chicago, SOM has a broad portfolio of large-scale projects around the world, from Dubai to Beijing to Dublin. It is responsible for the Burj Khalifa in Dubai, as well as the One World Trade Center building under construction in New York City.